Love the colors, the wool sock is truly an all-season sock. Light weight and is a good all weather sock. Stylish and great for cool dayside! I like a sock that fits well, provides just enough insulation, and looks good as well. Theses socks provide all of this. Wool is great and these are comfortable. 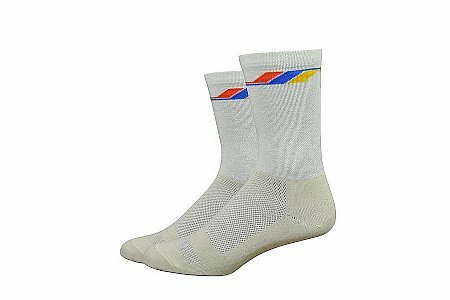 May need a larger size, they were a bit smaller after a wash.
Great sock for cooler rides. They keep your toes warm and dry. I even wear them around the house to keep my feet warm.